Author/Opus: This is the 49th puzzle from our contributing puzzlemaster Palmer Mebane. Rules: Place a digit from 1 to 9 into each empty cell so that, for each row above the bottom row, every digit is the sum or difference of the two digits immediately below it. 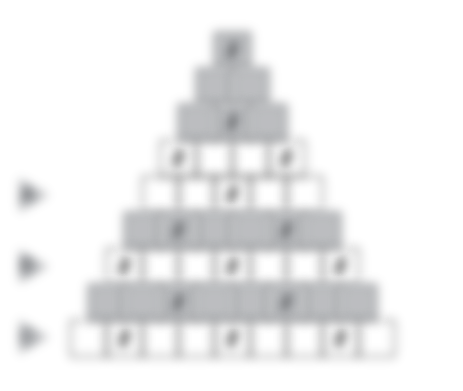 Rows marked in gray cannot have repeated digits; rows in white must have at least one repeated digit. Answer String: Enter the digits in the marked rows from left to right, separating each row with a comma. Author/Opus: This is the 48th puzzle from our contributing puzzlemaster Palmer Mebane. Rules: Standard Skyscrapers rules (using digits 1 to 7). 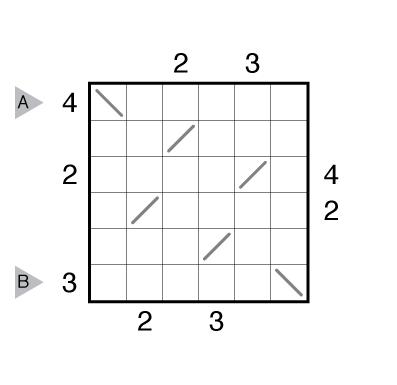 Also, there are some regions (”Sum baskets”) in the grid marked by dashed lines. 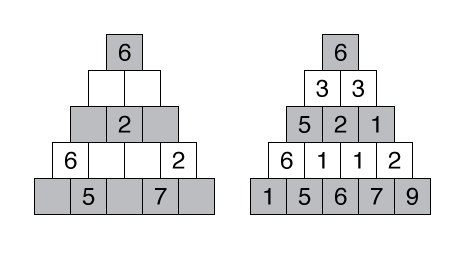 The sum of the buildings in these sum baskets is given. Building heights can repeat within a basket. Answer String: Enter the 1st row from left to right, followed by a comma, followed by the 7th row from left to right. Note: Follow this link for classic Skyscrapers puzzles and this link for variations on Skyscrapers puzzles. If you are new to this puzzle type, here are our easiest Skyscrapers Puzzles to get started on. More Skyscrapers puzzles can be found in The Art of Puzzles, and in our beginner-friendly collection Intro to GMPuzzles by Serkan Yürekli. Author/Opus: This is the 47th puzzle from our contributing puzzlemaster Palmer Mebane. Editorial Note: Many solvers can confuse Coral with another puzzle type with similar spelling. An easy way to remember the difference is that Cave has no R’s and also has no 2×2 Region constraint. 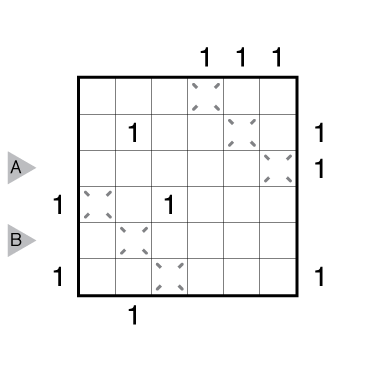 Coral puzzles, with an R, do have this region constraint. 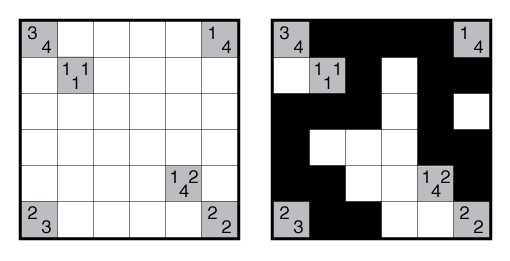 The other general rules (about not enclosing white spaces and having a single shaded group) are shared between Cave and Coral puzzles. Author/Opus: This is the 46th puzzle from our contributing puzzlemaster Palmer Mebane. Rules: Variation of Skyscrapers. Insert a digit from 1 to 5 into each empty cell so that each row and column has one copy of each digit and exactly one mirror. Each digit in the grid represents the height of a building, and clues on the outside of the grid indicate how many buildings can be “seen” when looking from that direction, including those seen through the mirror’s reflection. Buildings block the view of any building with equal or lower height behind them. Answer String: Enter the 1st row from left to right, followed by a comma, followed by the 6th row from left to right. Ignore the cells with the mirrors when entering the solution (i.e., just enter cells with digits 1-5). 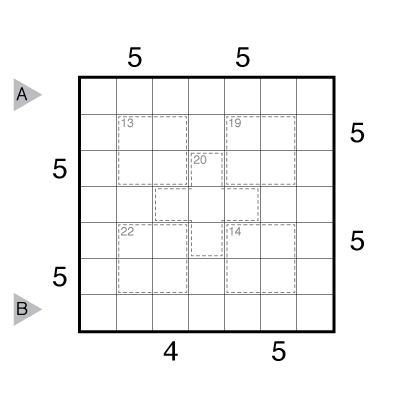 Author/Opus: This is the 45th puzzle from our contributing puzzlemaster Palmer Mebane. Rules: Combination of Skyscrapers and Battleships. Place the indicated fleet into the grid so that ships do not touch each other not even diagonally. 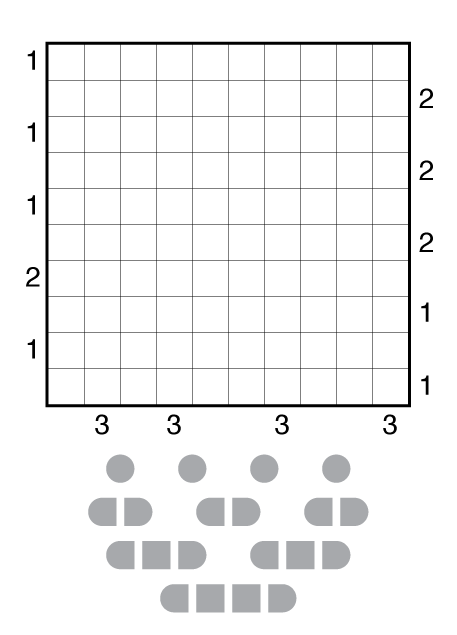 The size of the ship represents its height as in a Skyscrapers puzzle, and the clues outside the grid indicate how many ships are visible in that direction. Ships block the view of any ship of equal or smaller size behind them. Note: Follow this link for classic Skyscrapers puzzles and this link for more classic Battleships puzzles. Author/Opus: This is the 44th puzzle from our contributing puzzlemaster Palmer Mebane. Rules: Variation of Skyscrapers. Insert a digit from 1 to 5 into each empty cell so that each row and column has one copy of each digit and exactly one mirror. The direction of the mirrors must also be determined. Each digit in the grid represents the height of a building, and clues on the outside of the grid indicate how many buildings can be “seen” when looking from that direction, including those seen through the mirror’s reflection. Buildings block the view of any building with equal or lower height behind them. Answer String: Enter the 3rd row from left to right, followed by a comma, followed by the 5th row from left to right. Use the slash characters / or \ to enter the mirrors. 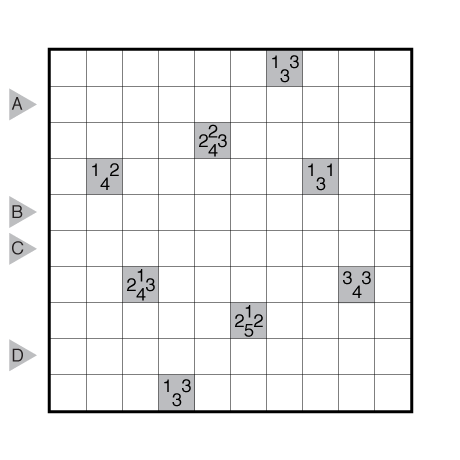 Author/Opus: This is the 43rd puzzle from our contributing puzzlemaster Palmer Mebane. Rules: Combination of Tetromino/object placement and Spiral Galaxies puzzle styles. 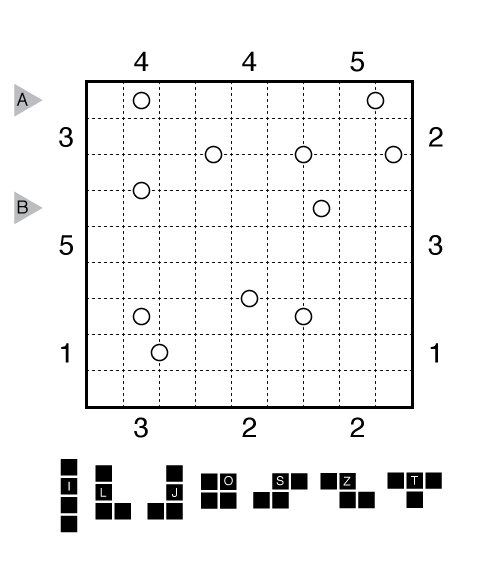 Place the seven tetromino shapes into the grid, rotations allowed but not reflections. Tetrominoes do not touch each other not even diagonally and they do not cover any cell with part of a white circle. Digits on the left/top of the grid indicate the number of cells used by tetrominoes in that row/column. Digits on the right/bottom indicate the number of different tetromino shapes partially in that row/column. All remaining white cells must be part of connected regions – “galaxies” – with rotational symmetry. Each galaxy must have exactly one circle at its center of rotational symmetry. Answer String: For each cell in the marked rows, enter the tetromino shape (as a capital letter IJLOSTZ) or the galaxy size in cells (enter just the last digit for any two-digit number). Separate the rows with a comma. An example answer would be “772TTT44SS,6664333LLL”.